Representative Mario Delgado posted this infographic about the National Guard following the sub-committee’s approval. Source: Mario Delgado, Twitter. 12/24/18 (written by kheinle) — The plan to create a National Guard (Guardia Nacional) in Mexico advanced through the first round of congressional approval. On December 20, 2018, the Chamber of Deputies’ (la Cámara de Diputados) Committee on Constitutional Affairs (la Comisión de Puntos Constitucionales) approved the bill 18 votes in favor to 6 against. If full Congress approves, the National Guard would be a 50,000-person armed force created from the ranks of the Mexican military and police. Mexican President Andrés Manuel López Obrador (AMLO) proposed the force to address the seriously high levels of crime and violence in Mexico. Mexico City Mayor Sheinbaum turned down the idea of the National Guard in Mexico City. Source: Vanguardia. Elected officials also voiced their concern. Mexico City Mayor Claudia Sheinbaum publicly announced that the National Guard would not be needed in the capital. The police are capable of delivering, she said, adding that the federal and local police forces would work closely together. Congresswoman Lucia Rojas also argued that the National Guard would only deepen the military-focused strategy already in Mexico. “And it’s become clear in the last 12 years,” she said, “that there’s absolutely no evidence that having the army on the streets helps to reduce the violence.” The military’s presence in Mexico’s domestic affairs has also led to an increase in the number of human rights violations perpetrated by members of the military against civilians, an issue that Justice in Mexico explored in a 2012 special report. AMLO is not the first Mexican president to pursue the idea of a National Guard. His predecessor, President Enrique Peña Nieto (2012-2018), initially called for a 40,000-person force that was eventually scaled down to 5,000. AMLO’s current bill will soon be presented to the full Chamber of Deputies for consideration. Daly, Catherine et al. “Armed with Impunity: Curbing Military Human Rights Abuses in Mexico.” Justice in Mexico. July 2012. June S. Beittel, “Mexico: Organized Crime and Drug Trafficking Organizations,” Congressional Research Service, July 3, 2018. “Mexican president-elect’s party presents national guard plan.” Reuters. November 20, 2018. Roldán, Maríhiz. “Más de 500 organizaciones manifestan su rechazo a la Guardia Nacional.” El Universal. November 20, 2018. Angel, Arturo. “Los cambios clave en la propuesta de Guardia Nacional que fue aprobado en comisiones.” Animal Político. December 20, 2018. Jiménez, Horacio and Alejandra Canchola. “Guardia Nacional arrancaría con mando militar y Senado la podría disolver: Delgado.” El Universal. December 20, 2018. “Asylum seekers will be sent back to wait in Mexico.” Latin America News Dispatch. December 21, 2018. “Diputados de México aprueban en comisiones la nueva Guardia Nacional.” RT. December 21, 2018. Magallán, Antonio. “Sheimbaum se revela contra la Guardia Nacional de AMLO; asegura bastará con la Policía Federal y municipal.” Vanguardia. December 21, 2018. Sánchez, Citlal Giles. “Preocupa a represenante de la ONU en México creación de la Guardia Nacional.” La Jornada Guerrero. December 22, 2018. Data collected by INEGI show insufficient levels of training completed by Mexican Police throughout the country. 12/04/18 (written by kheinle) — Recent reports indicate that the majority of Mexican police are insufficiently trained on the New Criminal Justice System (Nuevo Sistema de Justicia Penal, NSJP). 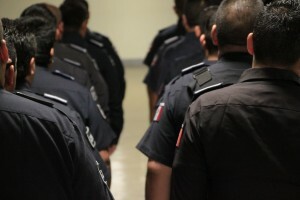 Just over half of all police have attended only one of three required NSJP-related trainings, according to the National Institute of Statistics and Geography (Instituto Nacional de Estadística y Geografía, INEGI). Meanwhile, 80% of Mexican police have concerns over the system’s implementation. As outlined by the Ministry of the Interior (Secretaría de Gobernación, SEGOB), one of the required workshops focuses on first responders, scene preservation, and evidence collection. Only 12 of Mexico’s 32 states and Federal District (Distrito Federal, DF) have had over 50% of its officers complete this training. The second course covers the role of police in the beginning stages of a case’s investigation. Only six states have had at least 50% of its forces trained. The third training focuses on the joint criminal investigation involving preventative and investigative police. Even fewer states – four – have had at least half comply. Only two states have had a majority of their police complete all three trainings: Chiapas and Coahuila. One reason for the police’s insufficient training, argued Alberto Capella, Quintana Roo’s Minister of Public Security, is the flawed structural design of the NSJP’s implementation period, which spanned eight years (2008-2016). In an article by Noticieras Televisa, Capella notes that little pressure was put on local governments to ensure their police were sufficiently trained until the end of that eight-year window. Chihuahua Attorney General César Peniche also commented on the unequal levels of training among judicial system operators. He argued that the criminal justice system must adapt in order to fill these voids. For his part, a professor of Criminal Justice at the University of Barcelona in Spain and a native of San Luis Potosí, David Ordaz Hernández commented on the overall stagnation in the implementation of the NSJP. He faulted the lack of training of justice system operators—including police—as a main reason for its delay. Insufficient training often leads to judicial processes being done by hand, he argued. The operators do not have the learned methodology or full understanding of the system, and these inefficiencies add up. In November, several municipal mayors and local officials acknowledged the insufficient levels of training. As reported by news source Multi Medios, Cristina Díaz, the mayor of Guadalupe, Nuevo León, for example, said that in addition to fully training police forces, they also ought to work with police in the traffic division (“los agentes de tránsito”). Other local officials, however, defended the progress of their municipalities and their efficiency with processing the law. “México enfrenta reto de seguridad y aumento en homicidios, análisis en despierta.” Noticieros Televisa. November 8, 2018. Villasena, Mayte. “Se comprometen alcaldes metropolitanos a capacitar a policías.” Multimedios. November 14, 2018. Martínez, Abel. “Policías de México no han sido actualizados en Sistema de Justicia Penal.” Tribuna Noticias. November 22, 2018. Morales, Rosa María. “El Nuevo Sistema de Justicia Penal, aún en pañales: David Ordaz.” Pulso – Diario de San Luis. November 26, 2018. Five police were kidnapped from the Tizupan Police Station seen here in Aquila, Michoacán. Photo: Secretaría de Seguridad Pública. 03/06/17 (written by D. Blanchard and K. Heinle) – Michoacán has witnessed several events in early 2017 surrounding organized crime-related activity that have kept the state in the news. 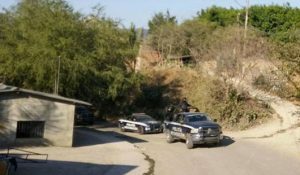 On February 5 in the early hours of the morning, five police officers were kidnapped from their police station in the village of Tizupan, Aquila in Michoacán by alleged cartel members posing as military personnel. Several hours later, the alleged suspects called the station using a payphone to demand that the Tizupan Municipal Police step down in exchange for the release of the kidnapped officers. After news broke, the mayor of Aquila, José Luis Artega, accused former members of the Knights Templar Organization (Los Caballeros Templarios, KTO), Jesús Cruz Birrueta, “El Chuy Playas,” and Fernando Cruz Tena, “El Tena,” of being behind the kidnapping, reported news outlet Milenio. According to authorities mentioned in the same report, the kidnapping and subsequent demands were part of the organized crime affiliates’ efforts to regain control of the drug trafficking operations along the Pacific Coast, of which Michoacán is a prominent route. Michoacán’s Secretary of Public Security (Secretaría de Seguridad Pública, SSP) announced soon thereafter that security in the region had been strengthened and a search party was formed to locate the kidnapped officers. On February 8, the five police officers were safely let go. A leader of the self-defense group (grúpo de autodefensa) in the region, Cemeí Verdía Zepeda, attributed their release to the “joint work of the state and local security forces, as well as the strength of the indigenous communities of Aquila.” He was unable, however, to give further details of the operation. Michoacán’s head of government (Secretario de Gobierno), Adrián López Solís, meanwhile, called for an investigation to determine who is responsible for the kidnapping, which appears to be ongoing. Aquila Mayor José Luis Arteaga. Photo: Especial, Proceso. This is not the first time the KTO’s presence in Aquila has caught the public’s attention. In 2013, Aquila’s residents rose up against the Knights Templar, fighting to regain control of their community that the organized crime group had secured. Since then, a statewide strategy to target criminal activity has been in force. As Justice in Mexico reported throughout the years, the strategy led to some noteworthy success in specifically bringing down the KTO. 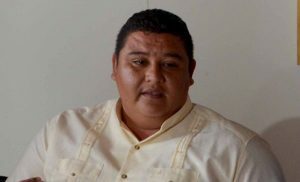 The KTO’s fourth and final leader, Servando “La Tuta” Gómez Martínez, was arrested in 2015 following the take down of the KTO’s other prominent leaders the year before. 2014 also saw the arrest of the sixth mayor in Michoacán with ties to the Knights Templar, a trend that exposed the deep-seated corruption within the state. Just one month after the police officers’ kidnapping, a leader of the organized crime group (OCG) Los Viagras was shot and killed in a shootout between alleged rival cartels. Juan Carlos Sierra Santana, “La Sopa,” was gunned down on March 5 in Aguililla, Michoacán. The Secretaries of Public Security (SSP) and National Defense (Secretaría de la Defensa Nacional, SEDENA) confirmed the La Sopa’s death. He was one of seven brothers who allegedly helped coordinate and direct Los Viagras under the leadership of “El Gordo Santana,” writes Proceso. Michoacán Governor Silvano Aureoles Conejo acknowledged in fall 2016 the “fragile calm” that existed in Michoacán thanks to current and previous administrations’ work to unify police (e.g., Unified Command, Policía Única), decrease levels of crime and violence, and strengthen public security and stability in part because of the military’s presence in the streets, among others. Still, some recognize “the problems Aureoles inherited” when he took office in 2015. Mayor Alfonso Martínez Alcázar of Morelia, Michoacán, for example, noted in Proceso that these challenges have gripped the state for years. The kidnapping and safe release of the five policemen in Tizupan, as well as the death of Los Viagras’ leader La Sopa, shine a light on the ongoing presence of organized crime in the Michoacán region, and the coordinated efforts between federal, state, and local government to protect rule of law. “Mexico’s federal forces take down third Knights Templar leader in three-month span.” Justice in Mexico. April 1, 2014. “News Monitor.” Vol. 9, No. 10. Justice in Mexico. October 2014. “Servando ‘La Tuta’ Gómez captured in Michoacán.” Justice in Mexico. March 1, 2015. Castellanos J., Francisco. “’Michoacán vive una calma frágil’, dice Aureoles en su primer informe.” Proceso. September 18, 2016. “Secuestran a 5 policías en Aquila.” Milenio. February 6, 2017. “Liberan a policies secuestrados en Aquila, Michoacán.” Proceso. February 8, 2017. Arrieta, Carlos. “Aquila: liberan a los cinco policías secuestrados.” El Universal. February 9, 2017. Castellanos J., Francisco. “En enfrentamiento muere uno de los líderes de Los Viagros en Michoacán.” Proceso. March 5, 2017. Source: Open Society Justice Initiative. To arrive at the conclusion, the report begins with homicides. Only 10% of homicide cases that occurred between 2007 and 2012 resulted in convictions, the report reads, and only 16% of homicide investigations opened by federal prosecutors from 2009 through July 2015 led to indictments. The data proves worse for disappearances, whether criminal or enforced (perpetrated by state actors/law enforcement). 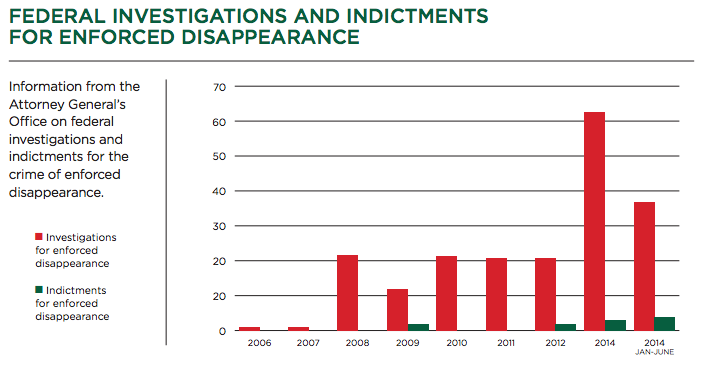 As of February 2015, only 13 convictions resulted from 313 federal investigations into enforced disappearances, and not until August 2015 was a single soldier ever convicted for his or her involvement in cases of disappearances despite evidence proving otherwise. Meanwhile, 12 indictments and eight judgments were issued in 1,884 federal investigations into torture between 2006 and 2014, and cases of torture resulted in only six convictions between 2007 and April 2015. Taking these findings into consideration vis-à-vis Mexico’s obligation to the standards set forth in the Rome Statute, the “analysis finds that the situation in Mexico meets the legal definition of crimes against humanity.” The report also considers Mexico’s responsibility as a state to protect its people, arguing that the government’s ability to do so has been undermined by its own legitimate strategy launched in 2007 by then President Felipe Calderón (2006-2012) against organized crime. Undeniable Atrocities writes that the strategy “deployed the military and federal police [to the streets] to use overwhelming extrajudicial force against civilian populations perceived to be associated with criminal cartels, without adequate regulations on the use of force, and with almost no accountability for any of the abuses that followed.” Not only has this strategy led to an increase in human rights violations without proper oversight of the deployed military and police, but it also has hindered the Mexican government’s ability to protect its people. This can be considered ironic given the strategy’s ultimate goal was to increase the country’s safety and security by eliminating organized crime. The government’s role in human rights violations discussed in Undeniable Atrocities (homicide, enforced disappearance, and torture) has long been a focus of national and international concern. Mexico’s National Human Rights Commission (Comisión Nacional de los Derechos Humanos, CNDH) is a reputable, independent source that documents these violations by state actors, as found in their public Recommendations (Recomendaciones) that detail credible accusations of violations and recommendations for how to mitigate and rectify the situation. Source: “Undeniable Atrocities: Confronting Crimes against Humanity in Mexico.” Open Society Justice Initiative. In 2016 alone, five such CNDH recommendations have been issued to the Secretary of National Defense (Secretaría de la Defensa Nacional, SEDENA) and an additional five to the Secretary of the Navy (Secretaría de Marina). The rate of recommendations issued against SEDENA (five recommendations over nine months for a .56 rate of recommendations/month) is significantly less than what Justice in Mexico documented in its 2012 report, “Armed with Impunity: Curbing Military Human Rights Abuses in Mexico.” Data used in that report shows that over a 62-month span under President Calderón dating May 2007 through July 2012, 101 recommendations were issued against SEDENA at a rate of 1.62 per month, thus nearly tripling SEDENA’s current rate. On the other hand, SEMAR’s rate of recommendations in 2016 (.56) is significantly higher than its rate under Calderón, when only 17 recommendations were issued during the same 62-month span (.27 recommendations/month). Both military entities were recently issued recommendations from CNDH documenting human rights abuses, thus falling in line with the Undeniable Atrocities report. In August 2016, for example, CNDH’s “Recomendación No. 42/2016” detailed SEDENA’s role in a case in Tecpan de Galeana, Guerrero in 2012 that involved illegal search, arbitrary detention, and arbitrary execution of two minors and four adults. Two weeks later, CNDH issued a recommendation against SEMAR (Recomendación No. 43/2016) about a 2013 case in San Luis Potosí that involved violations of seven victims’ rights to liberty, personal security, personal integrity, and access to justice, as well as the torture of one of the victims. The role of authorities in violating human rights and committing crimes against humanity, as Undeniable Atrocities argues, thus continues to be a pressing and present issue in Mexico. According to Jorge Castañeda, Mexico’s former foreign minister (2000-2003), the Open Society Justice Initiative’s report is “the most crushing critique to date of the war against drugs waged by [Presidents] Calderón and Peña Nieto since the end of 2007.” Respected and well-known Mexican journalist Carmen Aristegui also weighed in after reading the report, declaring that a “big debate” should be initiated in Mexico to address the crimes against humanity and hold those responsible accountable. The Undeniable Atrocities report builds on that comment with its recommendation. “The government must act without delay,” it reads, “to acknowledge the gravity of the situation: it must initiate urgent, extraordinary measures, including the invitation of international assistance to ensure independent, genuine investigations and prosecutions.” It will be interesting to see how the Peña Nieto administration addresses such calls for action during its final two years in office. Full Report. 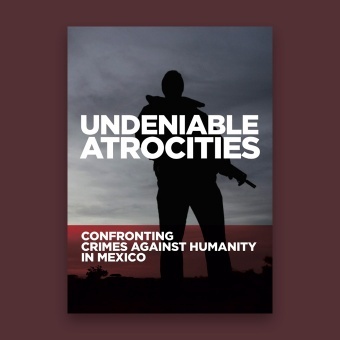 “Undeniable Atrocities: Confronting Crimes Against Humanity in Mexico.” Open Society Justice Initiatives. June 2016. Press Release. “Undeniable Atrocities: Confronting Crimes Against Humanity in Mexico.” Open Society Justice Initiatives. June 2016. “Undeniable Atrocities: Reactions.” Open Society Foundations. June 2016. Recomendación No. 42/2016. 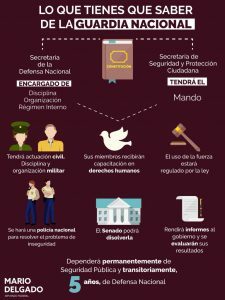 Comisión Nacional de los Derechos Humanos. August 31, 2016. Recomendación No. 43/2016. Comisión Nacional de los Derechos Humanos. September 14, 2016. Email communication. Varenik, Robert O. via Jillian Winkler. Open Society Justice Initiatives and Open Society Foundations. September 21, 2016. 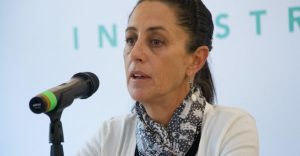 “La CNDH emite recomendación al Ejército por el asesinato de 6 personas, entre ellas 2 menores, ocurrido en Guerrero.” Sin Embargo. September 27, 2016. Web. “Recomendaciones.” Comisión Nacional de los Derechos Humanos. Last accessed October 1, 2016. 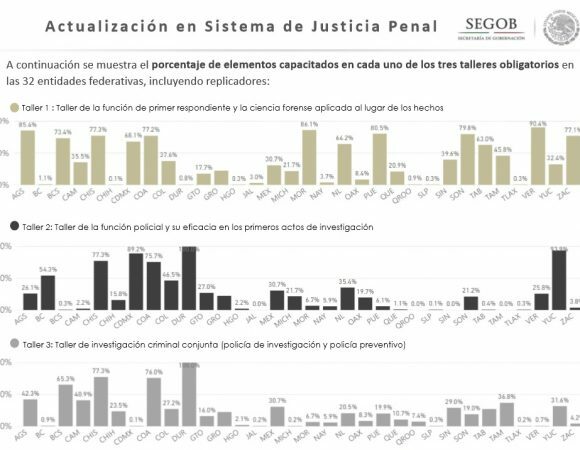 On March 12, 2015 Justice in Mexico presented the results of its latest Justiciabarómetro survey, titled: Diagnóstico integral de la policía municipal de Tijuana (in Spanish), developed in collaboration with the Institute for Security and Democracy (Instituto para la Seguridad y Democracia, INSYDE), the Law School of the Autonomous University of Baja California (Universidad Autónoma de Baja California, UABC) in Mexicali, the Woodrow Wilson International Center for Scholars and the University of Guadalajara (Universidad de Guadalajara, UdeG). 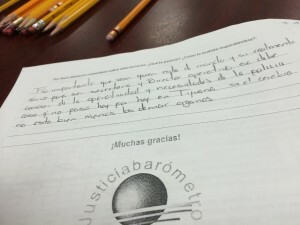 The Tijuana survey builds on the findings of two similar studies conducted in Guadalajara in 2009 and Ciudad Juárez in 2011, and was implemented for Justice in Mexico by the polling firm Data Opinión Pública y Mercados (DATA-OPM) form Mexico. Like these previous studies, the Justiciabarómetro-Tijuana constitutes one of the largest independent studies of municipal police ever published in Mexico. Focusing on the border city of Tijuana, adjacent to San Diego, California, this is the largest survey conducted by an independent group of institutions with 1,917 participants with a minimum margin of error (+/- .87%) and a confidence interval of about 99%. The average age of the police department is 38 years, and about 20% are female. 25% have some level of higher education either undergraduate or graduate, 35.8% completed high school, 18.4% have not completed high school, 15.6% reported having completed secondary school and only 5.3% incomplete secondary or lesser degree. 56.6% report an income of less than 15,000 pesos (around $1,000 USD), and most of them (85.5%) believe it would be fair an increase of about 51%. Officers note that they often have to buy their own equipment. Over 70% said they had to buy their own boots, over 60% say that have to buy their own uniforms, and many (43.3%) say that they do not receive equipment in a timely fashion. A 77.7% believe that police in Tijuana has improved in the last ten years, and 42.8% believe that citizens evaluated the police with high scores. Nearly 50% believe it is the citizens who foster corruption while 34.8% think it is citizens and police alike. Respondents indicate that the major security problems in Tijuana are burglary (56.1%), low scale drug dealing (13.7%) and car theft (6.5%). The problems identified as easier for municipal police to resolve are burglary (23.6%), traffic accidents (15.8%) and gangs (14%). The most diffcult to resolve are kidnapping (24.8%), homicide (21.1%), drug trafficking (17.55). 92.2% of the police say they do not have enough knowledge of the New Criminal Justice System, and 57.1% do not consider themselves ready to operate under the new system, which will be implemented nationwide in June 2016. Justiciabarómetro consist of a series of studies produced by Justice in Mexico Project at the University of San Diego’s Department of Political Science and International Relations, which provides policy analysis and recommendations concerning the rule of law in Mexico, based on the opinions and experiences of the operators of the criminal justice system. This survey was supported by the generous underwriting of the Open Society Institute. The Municipal Government of Tijuana and the Secretary of Public Security were supportive at all times facilitating access to the institution and its members, and providing the necessary logistical support. The study was coordinated by María Eugenia Suárez de Garay, David Shirk, and Octavio Rodríguez Ferreira, along with other law enforcement and security specialists from Mexico and the United States. TO VIEW THE FULL REPORT ONLINE (42.5MB PDF) PLEASE CLICK HERE.